ORLANDO, Fla. – Excitement hit the Johnson Outdoors Watercraft team when news spread of their big win at ICAST. The crew at their hotel busted out of their rooms announcing it to anyone within earshot as they headed out to celebrate. Marketing manager Luke LaBree related his “funny story.” He said the envelope advising winners to be at the awards ceremony came after he had already left for the hotel. 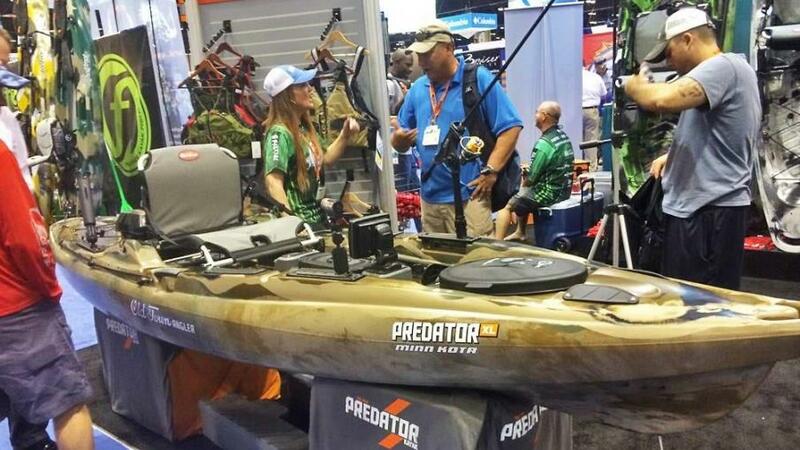 Their winning product voted on by media and buyers is the Predator XL, a 13-foot-long, 3-foot-wide kayak that weighs 95 pounds. Its attraction is a 45-pound thrust Minn Kota console mounted motor that is interchangeable with an electronics console or flat decking. With its original Predator winning last year, the Johnson Outdoors Watercraft team is familiar with what a Best of Show can do for business. There was a definite buzz at their booth, and not just with media and buyers coming to check out the overall winner. All the workers and staff were rather stoked. There’s was a huge sense of pride throughout the team members. “When we design things like this, we don’t just sit down in a closed-door room and come up with an idea,” LaBree said. “We involve our pro staffers, our dealers. We bring a council together and bring ideas. We get on the water and test it, and try new things. At the end of the day, everybody’s got a little feedback and we make modifications and go from there. More than 700 tackle products and accessories were entered by 253 companies into 24 “Best of Show” categories in the New Product Showcase this year. The “Best of Show” awards, sponsored by Rapala, were presented on Wednesday during the Chairman’s Industry Awards Reception.